As current islet-transplantation protocols suffer from significant graft loss and dysfunction, strategies to sustain the long-term benefits of this therapy are required. Rapid and adequate oxygen and nutrient delivery by blood vessels improves islet engraftment and function. The present report evaluated a potentially beneficial effect of adult human blood outgrowth endothelial cells (BOEC) on islet graft vascularisation and function. Human BOEC, 5 × 105, were co-transplanted with a rat marginal-islet graft under the kidney capsule of hyperglycaemic NOD severe combined immunodeficiency (SCID) mice, and the effect on metabolic outcome was evaluated. Although vessel density remained unaffected, co-transplantation of islets with BOEC resulted in a significant and specific improvement of glycaemia and increased plasma C-peptide. Moreover, in contrast to control mice, BOEC recipients displayed reduced beta cell death and increases in body weight, beta cell proliferation and graft-vessel and beta cell volume. In vivo cell tracing demonstrated that BOEC remain at the site of transplantation and do not expand. The potential clinical applicability was underscored by the observed metabolic benefit of co-transplanting islets with BOEC derived from a type 1 diabetes patient. The present data support the use of autologous BOEC in translational studies that aim to improve current islet-transplantation protocols for the treatment of brittle type 1 diabetes. The online version of this article (doi: 10.1007/s00125-012-2754-3) contains peer-reviewed but unedited supplementary material, which is available to authorised users. Islet transplantation is a promising therapy for patients with type 1 diabetes mellitus. Despite the recently reported improvement in metabolic outcome compared with the original Edmonton protocol , only 40–50% of patients remain insulin independent 5 years after transplantation [2, 3]. Although the mechanism of graft failure remains elusive, more than 50% of grafted islets are destroyed during the first few days after transplantation [4, 5]. To compensate for this early loss, an excessively high number of donor islet cells need to be transplanted , further depleting the already scarce pool of donor tissue. Therefore, strategies that preserve early graft function and survival are needed, reducing the required number of islets per recipient. When co-transplanted, rat aortic endothelial cells have been shown to support beta cell function and/or survival . Human cord-blood-derived endothelial progenitor cells (EPC) are beneficial to porcine islet graft transplantation via rapid graft revascularisation . Nevertheless, the possibility of using adult human endothelial cells derived from the diabetic islet recipient has not yet been examined. Human BOEC are a late outgrowing subtype of EPC  able to incorporate into newly forming vessels and provide trophic support to the host vasculature, as demonstrated in various models of tissue injury [10, 11]. Furthermore, the minimal invasiveness to procure them from peripheral blood favours their use in autologous transplantation protocols. We hypothesised that co-transplantation of human BOEC might improve islet engraftment in diabetic mice, ultimately resulting in amelioration of glycometabolic control. Male NOD severe combined immunodeficiency (SCID) mice, 9 weeks old, were obtained from Charles River Laboratories (L'Arbresle, Cedex, France) and housed alone or in pairs. The Principles of Laboratory Animal Care (NIH publication no. 85-23, revised 1985) as well as specific national laws were followed. In addition, the experimental plan was approved by the Ethical Committee for Animal Use of the Vrije Universiteit Brussel (VUB). For the induction of hyperglycaemia, the mice were injected i.v. with alloxan monohydrate (ALX) (Sigma-Aldrich, St Louis, MO, USA) at a concentration of 50 mg/kg body weight and only used for experiments when, at 2 days after ALX injection, 2 h fasting blood glucose levels had reached at least 19.5 mmol/l. As human beta cells were not systematically available for preclinical research projects and rat islets were readily available, a model of rat islet transplantation was adopted. Islets were isolated as previously described  from 6- to 10-week-old male Wistar rats (Janvier, Le Genest St Isle, France), weighing 250–300 g. After isolation, islets were cultured for 2 days in Ham’s F10, supplemented with 2% (vol./vol.) FCS, 0.5% (wt/vol.) BSA, 100 U/ml penicillin and 171.9 μmol/l streptomycin. At 1 h before transplantation, islets were washed twice and resuspended in PBS; only morphologically determined medium-sized islets (150–250 μm) were used for transplantation after being hand-picked by an independent investigator who was unaware of the experimental conditions. HUVEC were cultured according to the manufacturer’s instructions (Lonza, Verviers, Belgium). BOEC isolation and characterisation were performed as described previously . Isolations were approved by the Ethical Committee of the University Hospital, Brussels. Participants gave informed consent. For further details of the methods, please refer to the Electronic supplementary material (ESM). Non-diabetic BOEC were isolated from the peripheral blood of a 31-year-old male healthy volunteer and diabetic BOEC were derived from a 19-year-old female donor with type 1 diabetes (overnight fasting blood glucose, 14.6 mmol/l; HbA1c, 11.1% [98 mmol/mol]). Isolated BOEC were cultured and frozen in liquid nitrogen when they reached passage six. To allow in vivo tracing, BOEC were transduced at multiplicity of infection (MOI) 100 with a lentivirus encoding luciferase under control of the PGK promoter (at MOI 100, transduction efficiency with an enhanced green fluorescent protein (eGFP)-encoding lentivirus was close to 100%, as determined by FACS; data not shown), amplified until passage six and frozen in liquid nitrogen. At 1 h before transplantation, cells were thawed and resuspended in PBS. For each recipient mouse, 5 × 105 BOEC or HUVEC were mixed with islets. The islets or islet–BOEC/HUVEC mixture were centrifuged and washed once in 0.2 ml transplantation medium (BioWhittaker, Lonza) supplemented with 2% male NOD SCID serum (Charles River Laboratories). Mice were sedated using 10 μl/g body weight of 10 mg/ml ketamine + 0.1% (vol./vol.) xylazine, dissolved in physiological NaCl solution (0.9%; 154 mmol/l). Tail-tip blood, 6 μl, from the recipient mouse was added to the islet/cell pellet, stirred gently and left to clot for 4 min. The graft-containing blood clot was then inserted under the left kidney capsule. Tail-vein glycaemia was measured between 10:00 hours and 12:00 hours, following 2 h of fasting. For plasma C-peptide measurement, 0.25 ml blood was collected from the tail vein in tubes containing Na-EDTA (2.2 mg/ml blood) and aprotinin (0.14 mg/ml blood). The samples were put on ice immediately after harvest and centrifuged for 15 min at 800 g at 4°C. A 0.1 ml volume of plasma was collected per sample and subjected to RIA for C-peptide (Linco Research, St Charles, Missouri, USA). At 16 and 2 h before they were killed, animals were injected i.p. with 10 mg/kg body weight BrdU (Sigma-Aldrich). At 10 min after i.v. injection of biotinylated Lycopersicon esculentum (LE) lectin (Vector Laboratories, Burlingame, CA, USA), animals were killed by cervical dislocation; this was followed by whole-body perfusion with PBS and subsequently 10% (vol./vol.) neutral-buffered formalin (NBF) via catheterisation of the left heart ventricle. The pancreases were harvested and processed for quantification of the residual insulin content by RIA . The transplanted left kidneys were fixed overnight at 4°C in NBF, embedded in paraffin and the total graft area was cut into 4 μm sections. Insulin was detected using a guinea pig anti-insulin antibody (1/3,000; gift of C. van Schravendijk, Diabetes Research Center, Vrije Universiteit Brussel, Brussels, Belgium). The biotinylated LE was visualised with Alexa-fluor-555-conjugated streptavidin (1/500; Invitrogen, Carlsbad, CA, USA). Human endothelial cells were detected via binding with FITC-labelled Ulex europaeus agglutinin (UEA) lectin (1/50, Sigma-Aldrich). Proliferating cells were detected by BrdU staining with a mouse monoclonal antibody (MP Biomedicals, Illkirch, France), requiring enzyme-mediated antigen retrieval with 0.5 mg/ml protease (Sigma-Aldrich). Secondary antibodies were Cy2- or Cy3-labelled F(ab')2 fragments (Jackson Immunoresearch, Newmarket, Suffolk, UK), used at 1/100 or 1/500, respectively. TUNEL-positive cells were detected according to the manufacturer’s recommendations (In Situ Cell Death Detection Kit, Roche Applied Science, Vilvoorde, Belgium). For quantification of the beta cell and blood vessel volumes, images were captured using a Nikon Eclipse TE2000-E microscope using a ×40 magnification objective and the large image-capture feature so that the entire graft area of each section could be pictured at once. Insulin+ areas and lectin+ areas within the endocrine compartment were measured semi-automatically by ImageJ software on 20% (i.e. every fifth section) of the total graft. Volumes were extrapolated from the respective sums of these areas, as described . The vessel/islet ratio was calculated as (blood vessel volume/beta cell volume) × 100%. Vessel density was calculated as the number of intra-islet vessels/mm2. To determine the cell-death area, insulin-positive anuclear cell debris was manually selected and measured by ImageJ software. The cell-death area was calculated as the ratio of dead over total islet area × 100%. Mice were sedated using 1% (vol./vol.) isoflurane, shaved and injected i.v. with 150 mg/kg body weight d-luciferin (Promega, Madison, WI, USA). Photon emission on the ventral and dorsal sides of the animal was measured for 10 min using a photo imager camera (Biospace, Paris, France). For signal comparison between the different animals and time points, an elliptical region of interest (ROI) was drawn over the area of the left kidney and the AUC was determined. All values shown are means ± SEM. Two-tailed unpaired t tests or non-parametric Mann–Whitney tests were performed using GraphPad Prism version 5.0b for Mac (http://www.graphpad.com/). Results were considered significant when p was less than 0.05. To investigate whether non-islet endothelial cells can positively influence an islet graft, a model of marginal-islet-mass transplantation was developed. Immunocompromised NOD SCID mice were made diabetic by i.v. injection of the beta cell-specific toxin ALX. Two days later, 150, 75 or 60 hand-picked rat islets were transplanted under the left kidney capsule. The 2 h fasting blood glucose was measured weekly until day 28 after transplantation. While engraftment of 150 and 75 islets resulted in stable normoglycaemia by day 7 following transplantation, mice transplanted with 60 islets remained hyperglycaemic during the entire follow-up period (ESM Fig. 1). The latter condition was adopted as a suboptimal islet mass for co-transplantation with non-islet endothelial cells. In order to determine whether non-islet endothelial (progenitor) cells can improve islet graft function in vivo, 5 × 105 human BOEC or HUVEC were transplanted together with the marginal-islet mass. Changes in glycaemia and body weight gain were measured for 1 month after transplantation. While mice engrafted with islets alone (isletCtr) or in combination with HUVEC (isletHUVEC) returned to a state of severe hyperglycaemia 1 week after transplantation, mice engrafted with islets in combination with BOEC (isletBOEC) showed a persistent decrease in glycaemia from day 4 onwards (Fig. 1a). The observed differences in glycaemia were statistically significant from day 14 PTx; p < 0.0001 (isletCtr [n = 9] 30.30 ± 1.05 mmol/l vs isletHUVEC [n = 6] 28.22 ± 3.02 mmol/l vs isletBOEC [n = 7] 12.18 ± 3.27 mmol/l) until day 28 of the follow-up period (isletCtr [n = 9] 30.63 ± 1.69 mmol/l vs isletHUVEC [n = 6] 31.95 ± 1.27 mmol/l vs isletBOEC [n = 7] 18.36 ± 4.24 mmol/l; p < 0.01; Fig. 1a). In contrast to diabetic isletCtr or isletHUVEC mice, isletBOEC mice quickly regained normal body weight following transplantation, indicating overall better health status (Fig. 1b). Furthermore, the average C-peptide level of the isletBOEC mice was fourfold higher than in isletCtr and isletHUVEC (792 ± 188 pmol/l in isletBOEC [n = 7], 191 ± 42 pmol/l in isletCtr [n = 9] and 167 ± 38 pmol/l in isletHUVEC [n = 6]; Fig. 2a), explaining the observed difference in blood glucose. Day 28 blood glucose and C-peptide levels of normoglycaemic (NG) control animals were, respectively, 6.29 ± 0.69 mmol/l and 876.10 ± 213.60 pmol/l (n = 8). As HUVEC did not improve the metabolic outcome of mice with marginal-islet grafts, this experimental condition was not further elaborated. The insulin content of the endogenous pancreas of ALX-treated mice remained below 4% of non-diabetic control mice (Fig. 2b), indicating that the graft was responsible for decreased glycaemia in isletBOEC. These data indicate that BOEC improve glycaemic control and result in increased plasma C-peptide without affecting pancreas insulin content in marginal-islet-engrafted animals. To elucidate the mechanism behind the observed improvement of metabolic control following co-transplantation of islets and BOEC, kidneys were retrieved from isletCtr or isletBOEC mice at day 4 or 28 PTx for further analysis. Prior to killing, animals were injected i.v. with tomato lectin, which binds to functional blood vessels . Following labelling of tissue sections with specific antibodies, the insulin+ and lectin+ area of 20% of the total graft was measured to allow calculation of vessel and beta cell volume (Fig. 3). The mean vessel volume of isletBOEC grafts compared with isletCtr grafts was similar at day 4 PTx but had doubled by day 28 PTx (Fig. 3a, c). Graft-vessel density and vessel/islet ratio, calculated as the number of vessels per tissue area and the ratio of vessel to beta cell volume, respectively, did not differ in isletCtr and isletBOEC at day 4 and 28 PTx (ESM Fig. 2). Although rare, some BOEC were observed in the vessel lining of functional blood vessels inside the islet graft (ESM Fig. 3). While the mean beta cell volume of the isletCtr grafts was 1.51 ± 0.45 × 10 −2 mm3 (n = 5) and 2.25 ± 0.43 × 10 −2 mm3 (n = 7) at PTx days 4 and 28, respectively, two- and threefold higher beta cell volumes were found in isletBOEC grafts at day 4 (3.58 ± 0.79 × 10 −2 mm3 [n = 6]) and day 28 (6.98 ± 0.87 × 10 −2 mm3 [n = 5]) PTx, respectively (Fig. 3b, c). This difference in beta cell volume between isletCtr and isletBOEC was significant at day 28 PTx (p < 0.01) but not at day 4 PTx. Co-transplantation of BOEC and islets thus caused a doubling in the volume of functional blood vessels and a threefold increase in beta cell volume by day 28 PTx. As the beta cell volume of isletBOEC mice tended to be higher at day 4 PTx compared with isletCtr mice and significantly increased between day 4 and day 28 PTx, cell death and proliferation of the grafted beta cells was investigated. To evaluate the effect of BOEC on beta cell survival, TUNEL staining was performed at day 4 PTx to detect DNA fragmentation as a hallmark of beta cell apoptosis. No significant difference was observed in beta cell apoptosis level between isletBOEC and isletCtr, suggesting that BOEC do not protect against apoptosis-mediated beta cell death at day 4 PTx (7.83 ± 2.83% [n = 6] isletBOEC vs 4.35 ± 3.65% [n = 4] isletCtr; p > 0.05) (ESM Fig. 4). As TUNEL staining did not show beta cell apoptosis or necrosis earlier than day 4 PTx, we additionally screened for the presence of insulin+ anuclear cell debris inside the engrafted islets of isletCtr and isletBOEC mice, likely representing areas of cell death caused by apoptosis or necrosis before day 4 PTx. A significant increase in the cell-death area was observed in grafts of isletCtr mice compared with isletBOEC grafts (isletCtr [n = 5] 10.82 ± 5.37%; vs isletBOEC [n = 6] 0.93 ± 0.54%; p < 0.05; Fig. 4a, b). Moreover, large intra-islet erythrocyte lakes, a consequence of end-stage islet cell death , were predominantly present in isletCtr grafts (Fig. 4d, ESM Fig. 5). These data suggest that BOEC prevent beta cell death immediately after transplantation. To evaluate the effect of BOEC on beta cell proliferation, isletCtr and isletBOEC were injected i.p. with the thymidine analogue BrdU at 16 and 2 h before the animals were killed. Grafts were harvested at day 4 and 7 PTx, immunostained for insulin and BrdU and double-positive cells were quantified. Beta cell proliferation was similar under all conditions at day 4 PTx, but had almost doubled in the grafts of isletBOEC vs isletCtr mice at day 7 PTx (7.87 ± 0.61% [n = 4] vs 4.64 ± 0.44% [n = 7]; p < 0.05) (Fig. 4c, d). These data suggest that the increase of beta cell volume between day 4 and 28 PTx in isletBOEC grafts was, at least partly, attributable to an increase in beta cell proliferation. BOEC were transduced with the luciferase reporter gene (BOEC-luc), allowing in vivo tracing of the grafted cells by bioluminescence imaging (BLI). Non-transduced BOEC (serving as a non-luminescent control) and BOEC-luc were transplanted in diabetic mice and imaged at either the ventral or dorsal side of the animal at different times PTx. While a bioluminescent signal was not detected at any of the examined time points in isletBOEC mice or on the ventral side of isletBOEC-luc mice, a strong signal was emitted from the dorsal transplantation region of isletBOEC-luc mice on day 1 PTx (Fig. 5a, b). This signal decreased by 90% on day 4 PTx and disappeared by day 14 PTx (Fig. 5a, b). After 1 week, mice were killed after i.v. injection of luciferin to allow ex vivo imaging of the organs. In contrast to a weak signal remaining in the transplanted left kidney, no signal could be detected in any of the other organs examined (Fig. 5c). Thus, BOEC do not survive for extended periods after transplantation nor do they significantly migrate from the transplantation site, making them safe for use in a clinical setting. To enable autologous co-transplantation of BOEC with donor islets in a clinical setting, BOEC generated from patients with type 1 diabetes who will receive an islet graft, need to support a similar beneficial effect on the function of co-grafted islets as BOEC isolated from healthy individuals. A volume of 5 × 105 BOEC derived from a type 1 diabetes patient was transplanted together with 60 rat islets under the kidney capsule of diabetic NOD SCID (isletT1DBOEC) mice. The 2 h fasting glycaemia and body weight were recorded up to 28 days after transplantation. At day 28 PTx, blood was collected for quantification of the plasma C-peptide content. During the follow-up period, mice co-transplanted with type 1 diabetic BOEC displayed metabolic control similar to that of mice co-transplanted with control BOEC (Fig. 6). As a consequence, BOEC isolated from patients with type 1 diabetes are potential candidates for autologous transplantation to improve the metabolic outcome of co-engrafted donor islets. 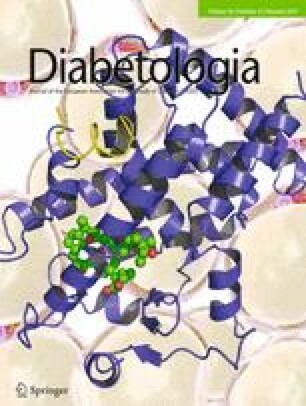 Early graft failure prevents long-term glyco-metabolic control in recipient type 1 diabetic patients [4, 5]. In addition, islet transplantation requires the use of multiple donors per recipient while donor organs are scarce. Therefore, strategies that improve the outcome of current transplantation protocols are urgently needed. Previous reports have shown that endothelial (progenitor) cells of different origin can improve transplanted beta cell survival and function [7, 8, 16]. Nevertheless, in contrast to these studies, which evaluated the effect of non-human and/or human cord-blood-derived cells, the present study pioneers co-transplantation of adult human peripheral BOEC with a marginal-islet graft and reports a significant BOEC-specific increase in plasma C-peptide levels and improvement in blood glucose control. As the insulin content of the endogenous diabetic pancreas did not change, an indirect effect of BOEC on the endogenous beta cell mass can be ruled out. Moreover, at day 28 PTx, a threefold increase in graft beta cell volume was observed in isletBOEC mice, thereby further supporting the beneficial effect of BOEC on islet cell transplantation. Interestingly, in isletBOEC mice, the trend towards an increase in beta cell volume was already apparent at day 4 PTx, likely reflecting a reduction in beta cell death before day 4 PTx. Islets of control mice showed an increased incidence of intra-islet insulin+ cell debris and erythrocyte lakes, the latter as a consequence of end-stage beta cell death  with subsequent erythrocyte deposition. While the observed differences in intra-islet insulin+ cell debris support an advantageous effect of BOEC on beta cell survival, the reduced prevalence of erythrocyte lakes in isletBOEC mice may result from BOEC-mediated prevention of erythrocyte lake formation and/or clearance of erythrocytes from intra-islet cell-death areas. Moreover, whereas the use of a blood clot facilitates delivery of islet cells under the kidney capsule , it cannot be excluded that this method increases the incidence of erythrocyte lake formation or that BOEC exert a beneficial effect on the deleterious consequences of instant blood-mediated inflammatory reaction, initially described after intra-portal islet transplantation  and potentially stimulated by the use of a blood clot in the current model. Besides differences in beta cell death, a significant rise in beta cell volume was observed from day 4 to day 28 PTx in isletBOEC mice, at least partly as a result of an increase in beta cell proliferation rate at day 7 PTx. Interestingly, while the proliferative capacity of beta cells has been questioned for many years, recent lineage-tracing studies have revealed the remarkable capacity of adult beta cells to support beta cell mass maintenance and regeneration through replication [19, 20, 21]. Our data underscore the potential of beta cells to replicate in an islet-transplantation setting and are in line with a beneficial effect of co-transplantation of EPC on the replication rate of the engrafted beta cells . Unlike Kang et al , the current report shows the effect of adult human outgrowth endothelial cells with autologous potential rather than the effect of cord-blood-derived EPC. While increased proliferation of islet cells, when co-transplanted with human cord-blood-derived EPC, was associated with an increased graft-vessel density , the grafts of isletBOEC mice showed no such increase at either the early or the late stages following transplantation. Nonetheless, the absolute volume of functionally perfused vessels increased more than twofold at day 28 PTx in isletBOEC compared with isletCtr mice, thereby indicating that vessel volume proportionally increased with the rise in beta cell volume. Whether this increase is causally related to and solely originates from the expanding beta cell mass or from additional BOEC-derived signalling remains to be determined. Of note, while some BOEC could be visualised inside the vessel wall of the islet grafts, its rarity precludes a major contribution of this phenomenon to the absolute increase in blood vessel volume. Based on the observation that vessel density was comparable between isletCtr and isletBOEC mice and on the rarity of BOEC that integrated in islet blood vessels, the positive influence of BOEC on islet transplantation likely results from a direct or indirect protective/trophic effect on the engrafted beta cells, rather than from their angiogenic potential. Even though others reported that endothelial cells can directly stimulate beta cell proliferation , future work will address this issue by determining whether BOEC can directly promote beta cell survival and proliferation in vitro. If this is the case, a search for the factors involved will be initiated. Compared with HUVEC, BOEC produce high levels of the angiogenic factors vascular endothelial growth factor (VEGF), placental growth factor (PlGF), platelet-derived growth factor β polypeptide (PDGF-B), angiopoietin-2 (ANG2) and matrix metalloproteinases (MMPs: MMP-1, -9 and -14), as well as hepatocyte growth factor (HGF) , the last of which has previously been identified as important for both endothelial and beta cell proliferation [23, 24, 25]. It is tempting to speculate that at least some of these factors orchestrate the beneficial effect of BOEC and thereby explain the observed differences between BOEC and HUVEC on islet transplantation. Transduction with luciferase-producing lentivirus enabled us to monitor the fate of the transplanted BOEC. While a bioluminescent signal was still detected in the explanted kidney at day 21 PTx, the in vivo luciferase signal was decreased to 10% of the level of the starting signal at day 4 PTx. Whether this loss of signal is due to clearance of BOEC by the remaining innate immunity in recipient NOD SCID mice or reflects the natural time course of BOEC survival when engrafted under the kidney capsule remains to be evaluated. Notably, as the positive metabolic effect of BOEC lasted up to at least 1 month PTx, it is likely that: (1) BOEC initiate a downstream cascade of events that support a long-term beneficial effect on co-transplanted islets; and/or (2) only a limited amount of BOEC are required to positively influence islet graft function and/or survival. As the bioluminescent signal gradually decreased and no extra-renal signal could be detected during the entire follow-up period, BOEC do not appear to bear tumourigenic and/or metastatic potential, a critical feature for clinical transplantation. Nonetheless, long-term follow-up is essential to further support this statement. Finally, the clinical applicability of the present approach was underscored by providing evidence that BOEC derived from a type 1 diabetic patient bear the same potential to reverse hyperglycaemia as their non-diabetic counterparts. This finding allows autologous use of BOEC, bypassing recipient immune reaction against allogeneic graft-supporting cells. As some endothelial cell types, such as liver sinusoidal endothelial cells , appear to possess antigen-presenting capacities that result in antigen-specific T cell tolerance, a feature which has also been attributed to mesenchymal stem cells (MSC) , the question of whether BOEC display a similar tolerogenic potential or, in contrast, enhance the immunogenicity of the islet cell graft merits further investigation. Furthermore, the effect of BOEC on human instead of rodent beta cell grafts, at the levels both of metabolic and immunogenic outcome, needs to be addressed in future experiments. In conclusion, BOEC improve the metabolic outcome of experimental rat islet transplantation, remain located at the engraftment site and do not clonally expand when grafted. BOEC harvested from a type 1 diabetic patient are equally functional and might represent an attractive candidate to improve the success of clinical islet transplantation. Special thanks to A. Demarré, K. Sterck, V. Laurysens, M. Jacobs, G. Stangé, L. Baeyens, J. De Jonge S. Devos and C. Peleman, from the Vrije Universiteit Brussel, and B. Hendrickx, from KU Leuven, for technical advice and assistance. Financial support was from the Institute for the Promotion of Innovation by Science and Technology in Flanders (IWT) (V. Coppens and H. Heimberg), the Research Foundation–Flanders (FWO) (H. Heimberg, N. De Leu and D. Jacobs-Tulleneers-Thevissen), the VUB Research Council (H. Heimberg), the European Union Sixth and Seventh Framework Program (H. Heimberg), the Belgian Federal Science Policy (H. Heimberg) and Programme Financing KU Leuven (PF/10/014; A. Luttun). T. Lahoutte is a senior clinical investigator of the FWO. All authors designed methods and experiments. VC, GL, KS, DJTT, KV and YH carried out the experiments. AL, KV and TL provided technical support and reagents. VC analysed the data. VC, YH, NDL and HH wrote the paper. All authors revised and approved the final manuscript.